After a flop of Q-10-3 with two spades, David "Bakes" Baker (right) check-raises all in, and Michael "The Grinder" Mizrachi (standing, left) quickly calls with Q-10 for top two pair. 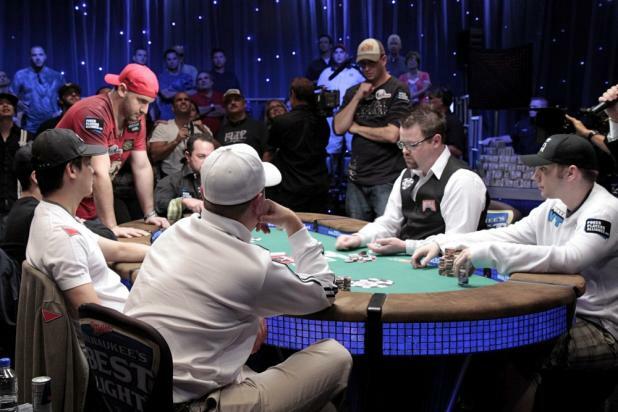 Baker shows K-10, and he'll need to catch a king to bust Mizrachi. The turn is a blank, and the jack on the river teases Baker with paint, but Mizrachi doubles up to 2.7 million as his brother Robert (standing, center) gives a quick fist pump. Baker takes a hit, but is still far from short with 1.8 million.